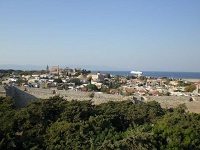 The Christmas celebrations were especially well attended this year both in Rhodes and on Kos. The Franciscan theatre was filled with the laugher and joy of children. The “Christingle story” was acted out by the children during the annual Carol Service at St. Francis’ Church. All the children received a Christingle and then they in turn carried a lighted christingles to all mothers and grandmothers present in the Church. Benediction of the Blessed Sacrament concluded the Carol Service and seems to fill the people with awe and wonder. Many of our non-Catholic brothers and sisters attend the carol service and they always ask about the beautiful Benediction liturgy and its meaning. It is opportunity for Evangelisation. They come into the presence of the Eucharistic Child King who bestows upon all His blessing. The community in Kos held their annual Carol Service which was very well prepared with enthusiasm by the parents and children together. The children at all the Christmas Liturgies received little gifts of chocolates. Each New Year’s Eve we are invited to the Metropolitan Greek Orthodox Archbishop’s residence for the cutting of the “Vassilopita cake” It is a most fitting way to end the old year in company of our Orthodox Brothers and Sisters with whom we feel very much at home. We have decided this year to produce a Lenten/Eastertide card that conveys our solidarity with and assurance of prayers for our friars and the people of Syria. St. Ephrem the Syrian calls this country to mind. The prayer on the reverse side of the card is one used by our Orthodox brothers and sisters during the Lenten period. We join them most fervently this year in our prayers for peace in Syria. Following the Custodial Chapter, we make each first Monday of the month a retreat day of prayer involving the parishioners Eucharistic Adoration is followed by Mass with the office of Sext. During the Mass a portion of the Holy Rule is read after the gospel and then a short commentary on it. It has proved very popular and the people are coming to know more about our Franciscan lives. If the enthusiasm continues we will think seriously about asking to re-open the Secular Franciscan Our Archbishop visits us every six weeks and when he is present he gives a commentary on our Holy Rule which has been very interesting and inspiring. On a happier note, we enjoyed the presence of 600 Knights and Dames of Malta in February who accompanied their Grand Master, Matthew Festing. They are known for their works of charity and mercy towards the poor and needy. This was well manifested a couple of years ago when the Austrian Knights of Malta brought 150 handicapped with them. The people of Rhodes were impressed with the care and devotion shown to their charges by the nurses whom they encountered all over the centre of town. The Knights enjoyed their stay in Rhodes this year and our small Catholic Community appreciated their positive and supportive presence. Several TV channels televised their Liturgy at St. Francis’ Church; a liturgy enhanced by the forty member Greek Orthodox Municipality choir who came and sang at the Mass. There were also several very positive articles in several local newspapers. It is the second time we have been honoured with the Consular staff of the Filipino Embassy. This year they were joined by their Ambassador and the Honorary Consul of the Philippines in Rhodes. During the visit, St. Clare’s parish hall was transformed into a temporary Consular Office. This enables the Filipinos from Rhodes and neighbouring islands to renew their passports and other necessary documents without having to fly to Athens. It is a big saving for the Filipino community and shows a great generosity on the part of the Ambassador and his staff. An open forum was chaired by the Ambassador with questions and answers. This was all followed by a delicious buffet meal and of course Karaoke! The Knights of Malta and the Filipino Ambassador received letters of welcome from the Custos. This gesture was very much appreciated and was in no small part due to the help and efficiency of Father Sergio Galdi ofm the Custodial Secretary, who is, so we are hearing from many friars, a much appreciated source of support and encouragement to many. The Archbishop visited us in February with his Deacon, the Rev. Dimitris Antoulas. He is a permanent deacon in the archdiocese of Athens. His son, Fr. George Altouvas is a priest in the same Archdiocese. We enjoyed their company and the deacon will return with his wife Georgia who is a restorer of sacred art. We have some pieces waiting for her! We never miss an opportunity when we have such talented volunteers. The volunteers have been so very good to us over the years and we thank God for them and pray with gratitude for their goodness. The Finish Lutheran pastor has returned from Finland accompanied by his Cantor and his wife, both of whom are also Finish pastors! We look forward to our continued ecumenical cooperation and collaboration. As always we have so many things to thank the Lord for and as we prepare ourselves in Lent for the glorious feast of Easter, let us say with heart and soul: We return Thee thanks O almighty God, for all Thy benefits. Who livest and reignest world without end. Amen! Happy Easter!